Preheat the oven to 350°F. Lightly grease a 7-by-11-inch baking dish (an 8-by-8 works too). In a small bowl, mix the uncooked quinoa with the spices. Pour into greased dish. 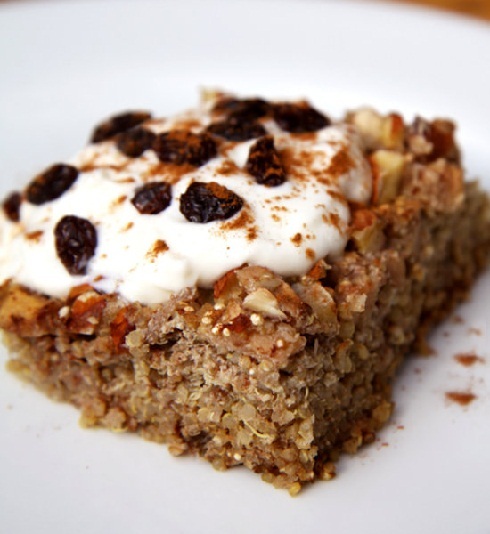 Sprinkle the apple and raisins on top of the quinoa. In that same small bowl, beat the eggs. Whisk in the soy milk and maple syrup. Pour the egg and milk mixture over the top of the fruit and quinoa. Lightly stir to partially submerge the fruit. Sprinkle the chopped almonds on top. Bake for one hour or until the casserole is mostly set with only a small amount of liquid left. Allow to cool, and then cover and refrigerate. In the morning, cut a square, microwave it on a plate, and enjoy alone or with a few dollops of Greek yogurt.